At the Duxbury Free Library on Tuesday, March 24th, from 7:00 -9:00pm, Authors Judith Canty Graves and Carson Graves will speak about "Empowering Parents in Special Education." Their talk will be based upon their book, Parents Have The Power To Make Special Education Work. The Graves will speak about lessons learned from the fifteen years their son was in special education. They will discuss practical strategies and ideas to help parents understand the special education process and how they can advocate for their children. Copies of their book will be available for sale that evening. A book signing will follow the presentation. 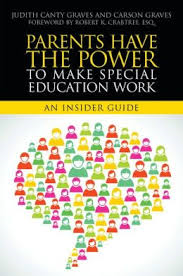 Many notable authorities in the field of special education have endorsed their book. Dr. Edward Hallowell calls this book a "must own for parents," and Richard Robison, executive director of the Federation for Children with Special Needs, says, "I heartily recommend this volume." More reviews and endorsements are on the authors' website. This event is sponsored in partnership with The Duxbury Free Library (77 Alden Street, Duxbury, MA 02332), Westwinds Bookshop, and The Parent Connection. RSVP on the event calendar of the Duxbury Free Library at www.duxburyfree.library.org, or call (781) 934-2721, ext. 5632 if you are interested in attending this event.